More people and organizations are legally fighting back against smear campaigns and libel. 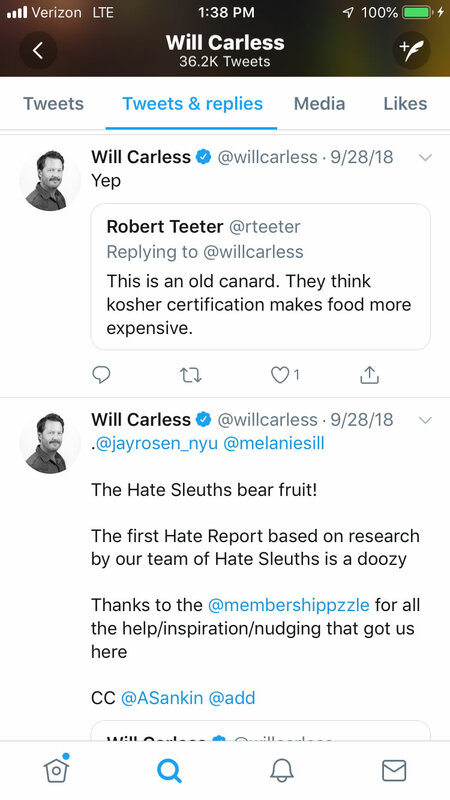 1 When both a Jewish journalist at the New York Daily News and the Jewish comedian he wrote about spoke harshly against the kosher-certification business, comparing it to mafia organized crime, there were no problems for either in the way outsiders like KosChertified? were treated. The NY Daily News still has an app in Apple’s App Store even though their printed comments were many magnitudes more offensive than the benign critique made by KosChertified? Double standards? (See “NYC kosHYPERLINK “https://www.nydailynews.com/new-york/ny-metro-kosher-restaurant-comic-20181209-story.html”hHYPERLINK “https://www.nydailynews.com/new-york/ny-metro-kosher-restaurant-comic-20181209-story.html”eHYPERLINK “https://www.nydailynews.com/new-york/ny-metro-kosher-restaurant-comic-20181209-story.html”r cops force restaurants to cancel bookings of lesbian Jewish comic”, Dec. 10, 2018). When public university UC Berkeley made a last-minute rejection of an ad in their campus paper The Daily Californian because it featured an image of Pepe’ the Frog, they cited the ADL as the source for labeling it as hate speech. When the private and Christian Pepperdine University of Malibu (California), published an ad from The OccidentHYPERLINK “https://www.toqonline.com/”aHYPERLINK “https://www.toqonline.com/”l QHYPERLINK “https://www.toqonline.com/”uHYPERLINK “https://www.toqonline.com/”aHYPERLINK “https://www.toqonline.com/”rHYPERLINK “https://www.toqonline.com/”terlHYPERLINK “https://www.toqonline.com/”y, a journal focusing on “Western Perspectives on Man, Culture and Politics,” into their campus paper, the senior editor publicly apologized in print the following week and sent a donation to the ADL in repentance…or was this tribute? 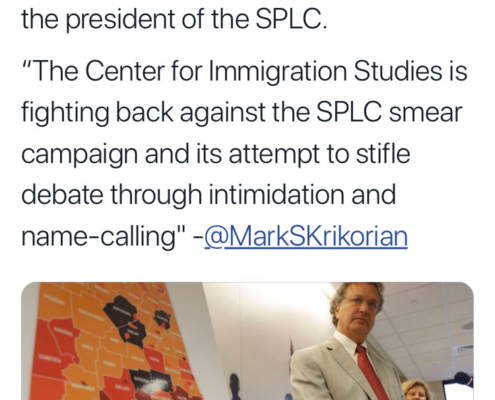 Monika Schaefer…Ursula Haverbeck…Sylvia Stolz……all who have suffered imprisonment for having “incorrect thoughts” and questioning certain aspects of “that which shall not be questioned”–“holocaustianity”. You see, the jewish “holocaust” is the one event in 20th-century history that has been turned into a sacrosanct “religion”, in which questioning the validity and veracity of holocaust “claims” can get one prosecuted for “thought crimes”. All three women have been incarcerated for just that. in a Lord of the Flies environment. I was totally unpolitical and innocuous at work. millenials spoke to me in the 2 1/2 years before my retirement. the constitution is LAW ZERO. any violation of the constitution should be punishable by death without appeal. The Constitution is crystal clear, having neither ambiguity nor contradiction? Why hasn’t President Trump made any movement whatsoever towards protecting our first amendment rights online? If he wants to secure a legacy for himself that can withstand the relentless smears of the leftist media both now and in the future, he absolutely needs to win a second term. That will prove much more difficult with so many of his ardent supporters being silenced by social media corporations. Secondly, why hasn’t any non-Jewish billionaire done anything to change the status quo with regards to social media platforms? Elon Musk, for example, has expressed impatience with the media and threatened to create a website that tracks fake news and the journalists who author it, but hasn’t followed through. Is there anything stopping someone like him from starting a free speech alternative to YouTube or Twitter? It wouldn’t even need to be built from scratch, as there are many functional Asian alternatives that are simply waiting for someone with money to launch them on the English-speaking web. Lastly, why aren’t any politicians or political parties in Europe running on a platform to bring American-style first amendment rights to their respective constitutions? All “hate speech” legislation that has been successfully lobbied for by the usual suspects should be repealed and replaced with true freedom of speech; anything less should be considered an affront to our European values. What other ethnic group would go out of their way like this to make themselves hated? What strange people (((they))) are. 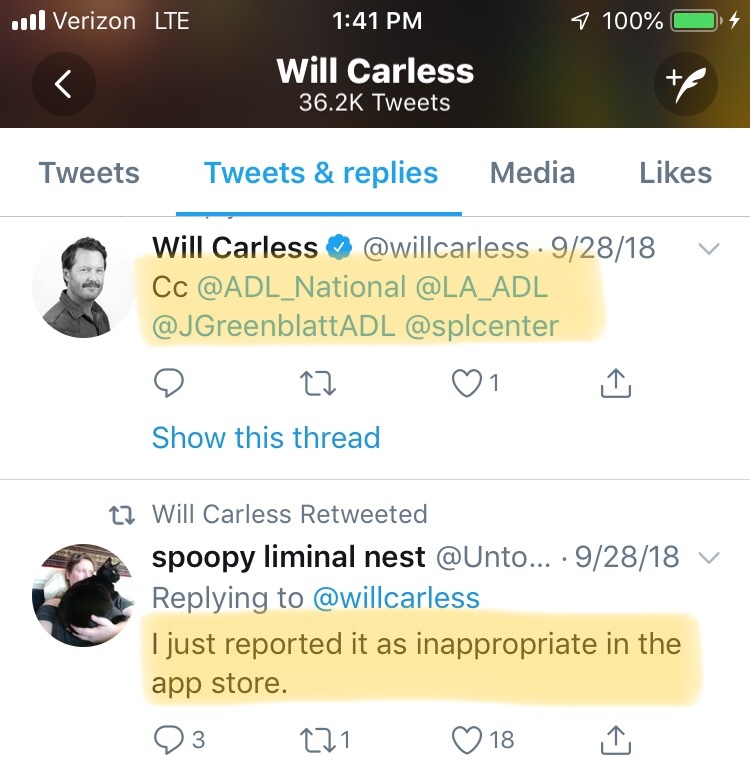 Nasty, nasty this deplatforming! Dirty Pool indeed. We succeed. . .because we do not name ourselves. . . The right seems fatally inept at politics, so I doubt their lawsuits will accomplish anything. There are no laws in the United States against so-called hate speech. The only way to dismantle a taboo is to break it, with vigor. The left does this successfully all the time. Maybe it will be necessary to proceed anonymously sometimes, but the anti-white left has way overplayed its hand and if the right can’t find a way to stigmatize them and put them on the defensive then it doesn’t deserve to win. 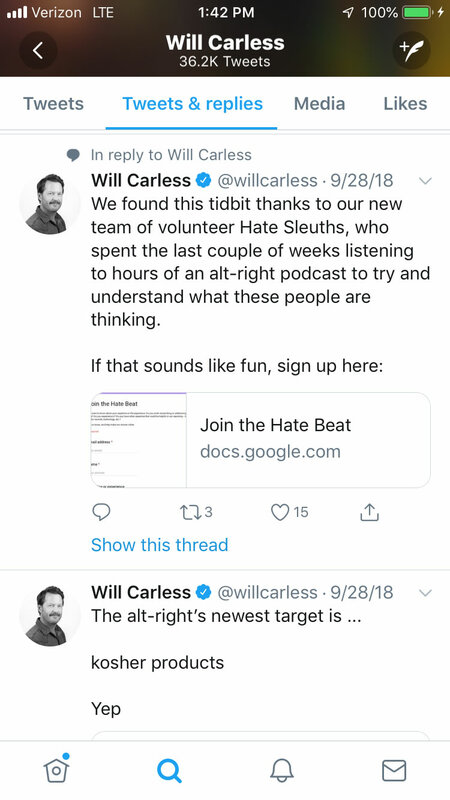 Unfortunately, too many on the Alt Right war just old-fashioned racists who have no sophistication at all when it comes to modern political discussions. In order to get anywhere it’s necessary to be offensive and land punches. Use all the words they tell you not to use. Again, anyone who lived through the 1960s shouldn’t need to be told this, and I know a lot of hard right people are elderly. They need to up their game a lot. If the truth is on your side that is a HUGE advantage so stop complaining. I wonder how koshering works. Is there pressure on all food mfrs to have this done and if they don’t, there’s hell to pay? I wonder what jews did (for food) prior to virtually packaged foods being certified. As far as I know, only the orthodox ones really care. 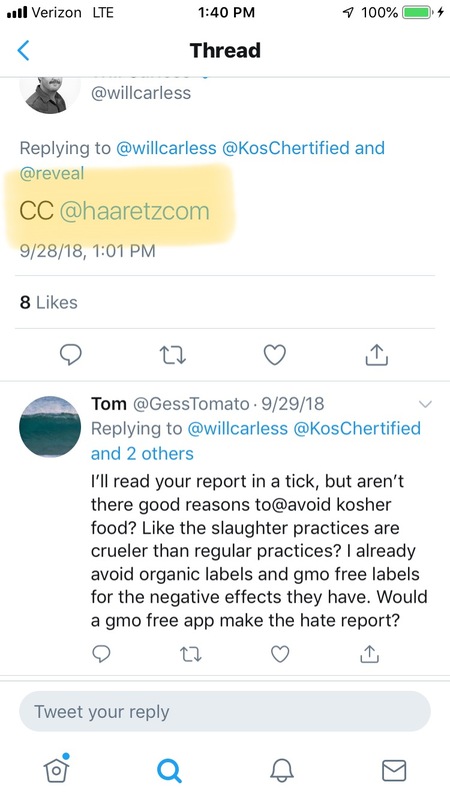 I recall seeing, years ago, a few food products with the Magic K sign, in a separate section of the supermarket, but overall, most foods were not kosher. I wonder how the kosherizers sell their service. Do they tell the food packagers that kosher food is somehow better? I see the most ghastly, laced-with-chemicals, junk food products with the symbol on them. Used to be that only big mfrs like Kraft and General Mills had their foods “done”, but now even food products made in small towns in small quantities are also clean ‘n’ proper. Look at this from a libertarian perspective. Is this article arguing for government oversight to prevent private discrimination on the basis of viewpoint? Do you want Big Brother to be the referee and decider of all private disputes? Where do you draw the line before slipping down this slope to even greater tyranny? What’s happening to Western society is a process of homogenization to prepare the goyim for enslavement by a one-world government run by you know who.